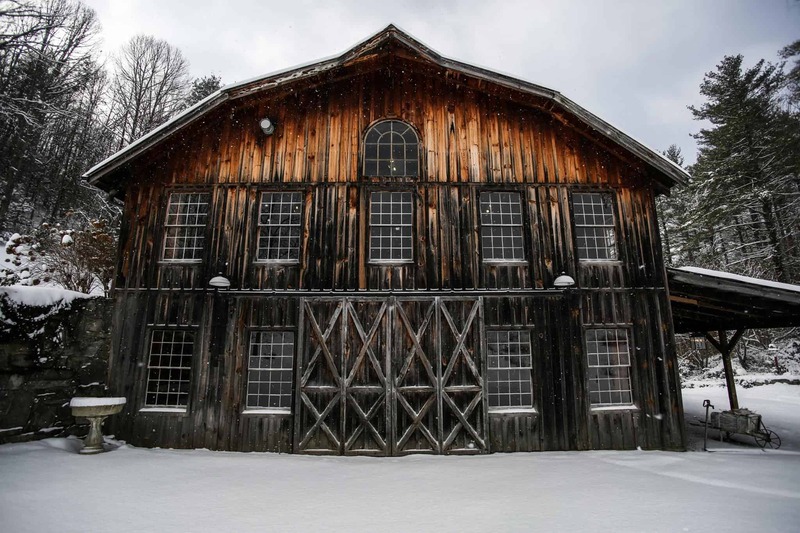 Elegant, yet naturally rustic and weathered post & beam barn built originally for our family-run antique shop featuring over 5,000 ft² of indoor space on two floors, with flexible layouts and an open floor plan. Tons of outdoor space under the attached covered overhang. The perfect place for smaller, more intimate weddings and events including dinners, receptions, and ceremonies for up to 100 people. Surrounded by towering white pines and mountain views, the barn’s side doors open to a quaint courtyard garden of boxwood, flowering trees, and perennials. Head down through the old gate toward the front lawn for long-range views of the farm layered before the mountains, a picture-perfect ceremony site. A hand-built stone staircase connects the courtyard to rear of the barn for easy access. Grand sliding doors open to a view of the cabin, rolling pastures and mountains – a naturally peaceful setting that is welcoming for all seasons and events.